I'm starting a lot of things and noticing new life everywhere. Gotta love New Beginnings and the positiveness it shares. 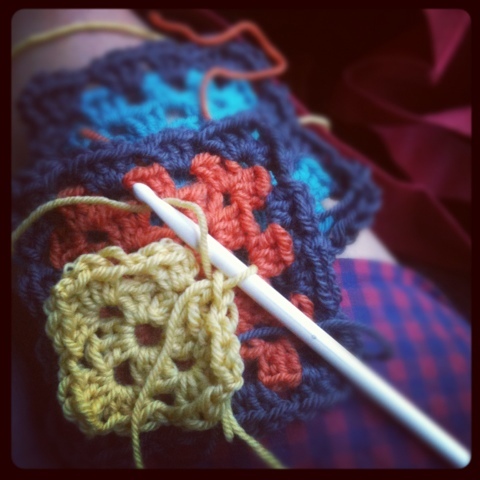 We visited the country to meet with Doris Day the Dog, before we got her, and the 2 and a half hour car trip looked completely daunting without crochet in my hands. I'm starting a smaller project than the bedspread/couch cover (which took a year! ), just a baby blankie for all the newborns over summer (there's at least 2 spesh kids I'd like to make things for!). 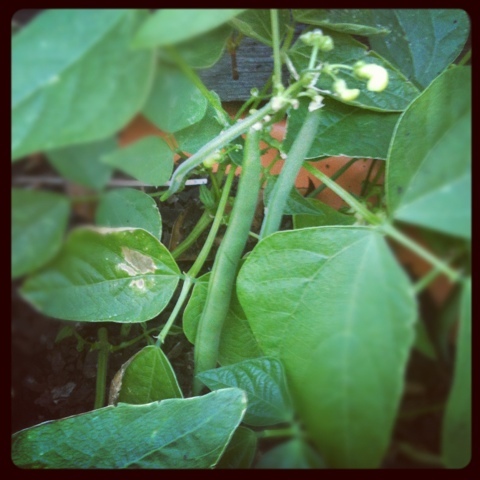 The garden also decided to have some New Beginnings and the beans just grew themselves! I merely provided them an occasionally water (I'm an official Lazy Gardener - had to dig out the azalias because they died - EEP) and they grew these! Yum! But Doris Day... another new life in ours. She's not allowed in the bedroom or the office (expensive computer gear of Husbie's does not need to be chewed!) so is very polite and just waits at the door. Too cute. Congratulations on keeping anything alive in the garden... I am of your type of gardener (bad bad English..eep!) but Doris Day looks lovely and well trained which a great start. Glad you have a new 4 legged friend! Pajama party in the lounge room then. I can see the LOVE in Doris Day's eyes. Sweetheart. We've cuddled on the couch, so you're right! She's too sweet! She's absolutely adorable! I love her! 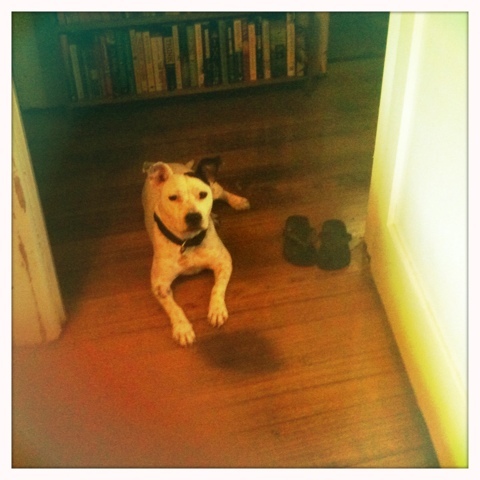 Wow, sitting next to a pair of shoes that are still intact - that is some impressive puppy restraint! Well done you for your lazy gardening success! I can kill almost anything in the garden while my husband can make anything grow - so I leave him to it. Have I made a quilt before? Yes, I made a new dress!